A gripping game turned in the Tide's favor as Glencoe defeated host Forest Grove 3-2 at Forest Grove High School Thursday night, Sept. 14. 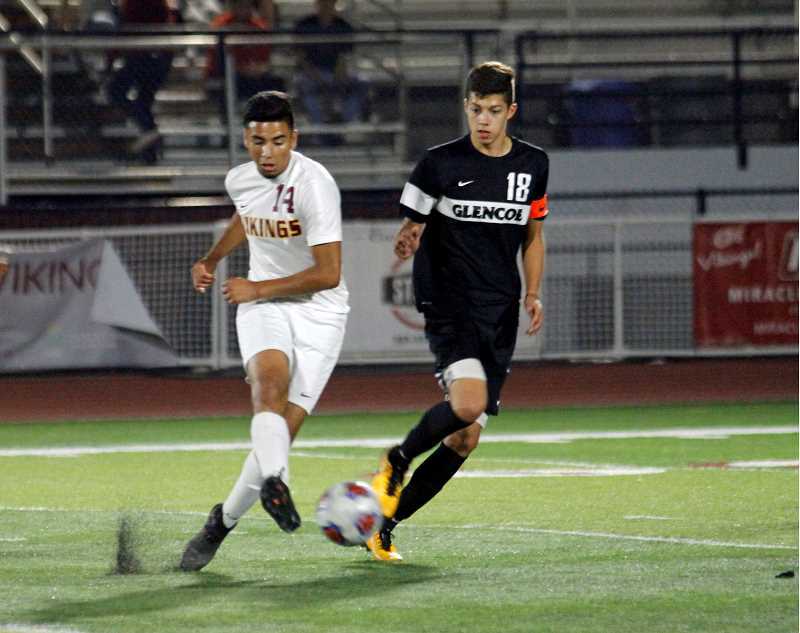 After giving up the initial goal in the 15th minute, the Crimson Tide scored three unanswered goals before a score in the 75th minute left the home Vikings scrambling for an equalizer — which, thankfully for Glencoe's sake, never came. "It really feels good to get a win," said Brubaker. "We've been playing some good soccer but have just been on the bad side of some results." Viking head coach Gracey Mosquera obviously felt differently, but also acknowledged the Tide were the better team on this night, while lamenting what could've been had his squad played with the consistency he wants. "I think we need to be more consistent and take advantage of our opportunities," said Viking head coach Gracey Mosquera. "This is a program that always tries to play good soccer. Unfortunately the opponent played well also, and they deserved to win in the end." Tide head coach Jonathan Brubaker seemed to take extra delight in the victory, citing some narrow Glencoe defeats as added fuel for a much-needed victory for his boys. 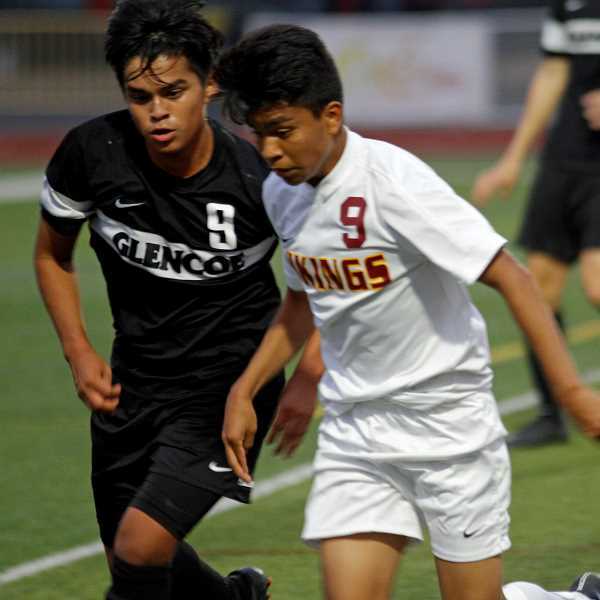 Glencoe tied the game 1-1 in the 28th minute when senior Jabree Sanchez-Diaz gained control of a ball muddling around in the box and drove it into the back of the net. From there, the two teams played the remainder of the first half primarily in the midfield before Forest Grove junior forward Oscar Macias narrowly missed from just inside the 18-yard box, leaving the two teams tied heading to halftime. The second half started with a great save by Glencoe goalie Oscar Flores-Reyes in the 43rd minute, followed 13 minutes later by a near miss by Forest Grove's Pablo Dominguez and another miss, this time on a free kick from near the edge of the 18-yard box at the 66th minute mark. However, Glencoe broke the tie three minutes later when senior defenseman Jeremy Ravelo-Romano scored on a miracle shot from the right side of the pitch from roughly 45 yards. "We have a lot of young players including our goalie who's a freshman," said Mosquera when asked about the goal. "It's unfortunate, but things like that can just happen." Ravelo-Romano, on a free kick, sent the ball high into the air in hopes one of his teammates would be able to get a head on it. But better yet, the ball sailed perfectly over the Viking goal keeper's head and into the net. "Coach puts me there to take those kicks from that distance, and I just saw the goal open and was hoping someone would go up for a header," said Ravelo-Romano. "But the ball just goes in sometimes." Brubaker admitted it was rather fortunate, but also emphasized it was also a product of simply giving oneself opportunities, something he's stressed to Ravelo-Romano of late. "I challenged Jeremy, who's too unselfish, to take three shots tonight and that was his third one," Brubaker said with a chuckle. "At halftime we talked about how their goalie is short in stature so we talked about putting shots up, and that's what he did." With the score 2-1, Forest Grove narrowly missed an equalizer a few minutes later when Santana Sanchez's header off of a Christian Contreras cross missed just high. Then the Tide added to their lead in the 74th minute when Glencoe sophomore forward Kobe Garcia sent a laser into the right side of the net from 21 yards out, giving the visiting Tide a 3-1 lead. Things looked bleak for the Vikings until Sanchez pulled Forest Grove within a goal a minute later to make the score 3-2. However, the Vikings failed to get the equalizer over the final four minutes, giving Glencoe their first win and leaving the home team pondering its mistakes. "This is a young roster and it's important we focus game to game," said Mosquera. "I think we can make the playoffs if we learn to play more consistently, but this game was definitely a bit of a step backwards for us." And for the Tide? A very satisfying win and one Brubaker hopes will give his team a boost heading into the tough Metro League slate. "We're a good team," said Brubaker. "I'm trying to forget about rankings and such, and use these six non-league games as a tune-up because the Metro League is no joke. We're warming up and getting better, so I feel really good about it and we've just got to keep plugging away." And a win over a good Forest Grove team is a good start. "My boys wanted to beat this team more than anyone else," Brubaker said. "More than Hilhi, more than Century, so I know they feel really good about it. We put together 80 minutes of good soccer tonight and that's a good start." Glencoe was scheduled to play at Reynolds Tuesday, Sept. 19, and is set to open conference play versus Southridge Sept. 25 at Hare Field.